I have a bunch of Easter/Spring Projects to show you today, so it will be a long post. My first card is from yesterday's Inspiration Challenge on Splitcoaststampers (SCS). 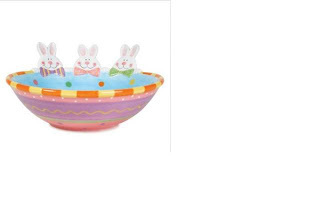 I chose the Easter Bunny Bowl pictured in the first photograph as my Inspiration Piece for the card in the second photograph. To make my card, I used card stock colors Only Orange, Bashful Blue, and Barely Banana. The designer paper is from DCWV. I mounted one bunny image up on dimensionals. Primas, ribbon, and brads were added for embellishment. The image is retired Stampin Up! 'Spring Gifts' and is colored with Copic Markers. My second card is a springy birthday card using this week's sketch from SCS. The designer paper is also from DCWV 'The Spring Stack'. Card stock colors are Regal Rose, Bashful Blue, Barely Banana, and white. The main image panel is mounted up on dimensionals. The stamp set is retired Stampin Up! 'Feathered Friends' and is colored with Prismacolored Pencils. I added an acrylic flower, brads, ribbon, and adhesive rhinestones for embellishment. Pictured in the third photograph is an Acetate Treat Box. You can find the directions on SCS under 'Resources'. To make the box I used acetate, Lovely Lilac, and white card stock. The image is from Stampin Up! 'A Good Egg'. I used Stampin Up! Scallop Circle Punch and Scallop Border Punch to make the scallops. Ribbon and Primas were added for embellishment. For my final project, I also found this small wooden cross at Michaels for $1.00. I covered it with designer paper (unknown) which was a very pain-staking process, then sanded and sponged the edges. I put vellum on the back of the cross. The flower, butterfly, and leaf dies are all from Cuttlebug and have been sponged with ink. The Easter Sentiment is from retired Stampin Up! "Glorious Gift'. I used Nestabilities to make the tag and added Stickles and ribbon for embellishment. I hope I have inspired you to start making some Easter Cards and Projects of your own. Always feel free to email me if you need further instructions. Oh my gosh, you've been a busy girl. These are so beautiful. Love them all! WOW Amy ... you certainly have been busy and they are all awesome!!! The spring colors are wonderful! BTW ... I have crocuses blooming ... yep!! These are all such great Easter projects. I like your bunny card so much better than the inspiration piece. The acetate flower is a fun accent on the other card. And what great treat holders. Btw... the featured stamper and inspiration challenges are usually posted at midnight. Since I'm up by 6 am everyday I see them early. Hubby normally doesn't get up until 8 so I have 2 hours to myself to craft and get my stuff posted. These are fabulous. I am sooo jealous. It's tax time and I have not had time to do anything but work. You are so talented. Keep up the great work.